Imagine you’re well away from the coast, you don’t even see land anymore on the GPS. Now, imagine that your boat is now taking on water, it’s overwhelming the bilge pumps, and you’re not getting radio reception, and there’s no response to the flares. What do you do? You may never need it, but when you do, it is literally a lifesaver. That 460MHz beacon reaches one of many satellites, and pretty soon there’s that big white helicopter with the big stripe on the side. NOAA’s fleet of weather satellites helped save 240 people last year from potentially life-threatening situations throughout the United States and its surrounding waters. NOAA’s polar-orbiting and geostationary satellites can detect distress signals from emergency beacons carried by downed pilots, shipwrecked boaters, and stranded hikers. Information captured from these satellites, including location, are then relayed to first responders on the ground who assist with search and rescue efforts. NOAA satellites are part of the international Search and Rescue Satellite Aided Tracking System, known as COSPAS-SARSAT. This system uses a network of spacecraft to detect and locate distress signals quickly from emergency beacons onboard aircraft and boats, and from PLBs. Since 1982, COSPAS-SARSAT has been credited with supporting more than 37,000 rescues worldwide, including more than 7,492 in the United States and its surrounding waters. The National Safe Boating Council’s (NSBC) Saved by the Beacon campaign is designed to educate recreational boaters about the importance of 406 MHz beacons and how to use them correctly in the case of a boating emergency. The Saved by the Beacon initiative will introduce the definition of EPIRBs (Emergency Position Indicating Radio Beacons) for boats versus PLBs (Personal Locator Beacons) for life jackets. NSBC will also compare the benefits of beacons to other commonly used mariner’s communications devices such as VHF radios, GPS trackers and cell phones. Celebrate the lives that 406 technologies have saved and join the 406Day photo share contest. 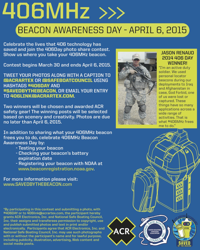 Show us where you take your 406MHz beacon. Tweet your photos along with a caption to @acrartex and @safeboatcouncil using hashtag #406Day, or email your entry to 406Link@acrartex.com. Two winners will be chosen and awarded ACR safety gear! The winning posts will be selected based on scenery and creativity. Photos are due no later than April 6, 2015. An understanding of the devices and their capabilities, illustrating the system capabilities, ensuring compliance and promoting NOAA registration supports efforts to compile the data and evaluate the success of the Saved by the Beacon message. This campaign is being developed and operated throughout 2015. For details email rjohnson@safeboatingcouncil.org or call (703) 361-4294.